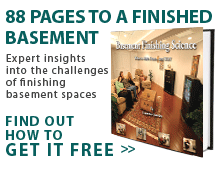 What can your basement flooring do for you? If you're using tile or ceramic flooring, the answer is "not much". While all basement flooring options have their strengths and weaknesses, you're going to want to spend your money on the best buy possible for your home. 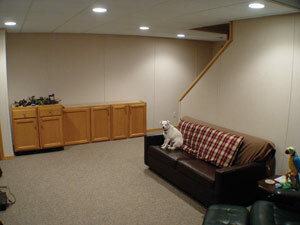 Total Basement Finishing knows which materials thrive in basement environments. To get a free quote for flooring options, contact your local TBF dealer today! Tiles come in a variety of makes (ceramic, stone, and marble), but no matter what is used, they all have one common weakness: grout lines. Unless the grout lines used in tile are continually maintained and resealed, they're going to become a home for mold, bacteria and mildew and will always be susceptible to damage from water and moisture. Grout takes days to cure, makes tile difficult to clean, and is tiresome to remove and replace. Additionally, the tiles themselves are cold underfoot in a basement and slippery when wet. Tile is durable, but it's also a hard, unforgiving surface, and damage from falls and dropped objects is going to be much more severe. Wood and plywood in a basement is extremely vulnerable to water and moisture. Even with a vapor barrier installed, moisture can still reach the flooring from foundation water leaks, plumbing leaks, bursting washing machine hoses, and failing water heaters. Once moisture has invaded the flooring, it can easily become a habitat for bacteria, mold, mildew, and insects. Basement carpeting is more forgiving of wood and is somewhat warmer underfoot, but it rots, grows odors, and grows mold just as easily as wood. If you're installing radiant heating in the basement floor, neither wood, tile, nor carpet is compatible with the installation. The grout lines on tile will crack as it expands and contracts under the shifting temperatures, while wood flooring acts as insulation, separating the finished basement area from the heat trapped under the floor. Carpeted floors have increased static electricity, and will continually give "shocks" to those who tread upon it.